The more I cook, the more challenging, complex and lengthy my recipes get. But sometimes all you want is a quick “dump and heat” recipe for those busy week nights. This recipe totally fits that bill. Don’t be intimidated by the long ingredient list because the preparation couldn’t be any easier. Spend 10 minutes chopping your veggies and then just dump in the rest and heat it up. Easy. Not only is this recipe super easy but I’m not sure if it could be any more healthy. I mean, you’ve got vegetables of every kind, shape and color, beans bursting with fiber and antioxidants and a complete, vegetarian source of protein (beans + pasta = complete protein source). The dish is colorful and fun which should make it a hit with kids. 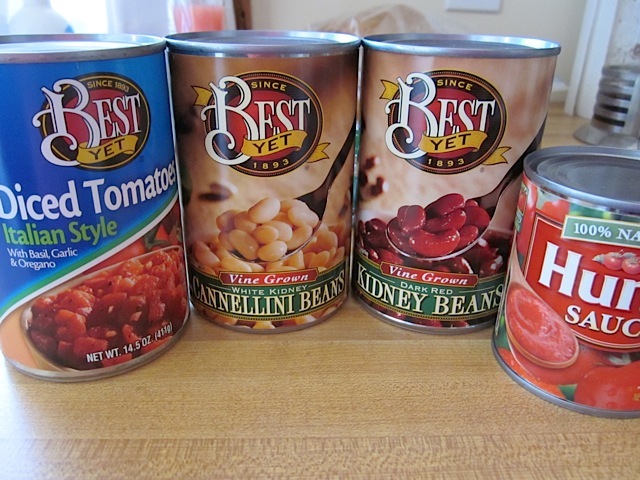 If you want to put in a little extra time and effort, you can cook dry beans and add a few cups of each in place of the canned beans. This will reduce the sodium content and cost in one fell swoop. Pasta e Fagioli can take many forms. I’ll list a few variations at the end of this post. 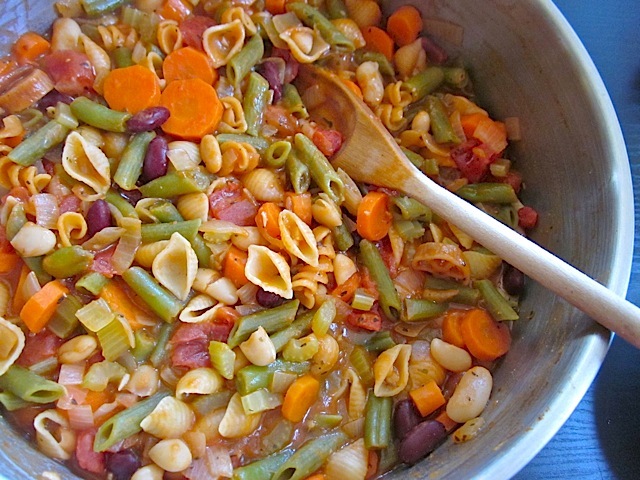 This non-traditional pasta e fagioli is full of vegetables, beans, and pasta to fill you up with flavor and nutrients! Chop the garlic, onion, celery and carrots. Place them in a large pot with 2 Tbsp of olive oil and cook over medium heat until the onions become transparent (3-5 minutes). 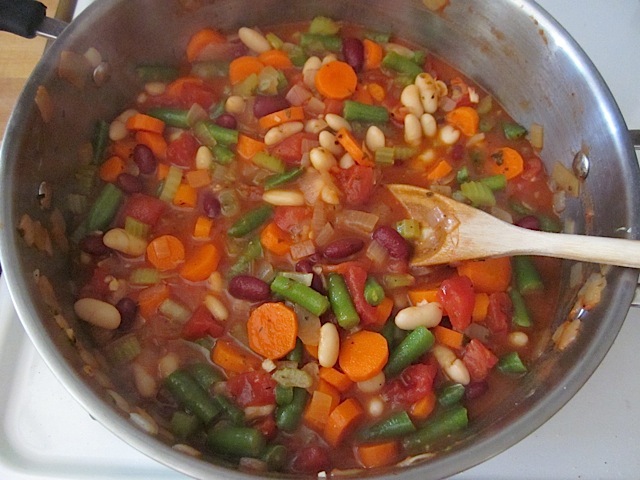 Add the herbs (parsley, basil, oregano, red pepper), the canned items (beans, diced tomatoes, tomato sauce) and the frozen green beans. Drain the beans but not the tomatoes before adding to the pot. Stir everything together and bring it up to a simmer. Add the chicken (or vegetable) bouillon and 3 cups of water. Stir it up a bit to dissolve the bouillon. Add the dry pasta and bring the pot up to a simmer. Add a lid and let simmer for about 10 minutes or until the pasta is fully cooked. Stir the pot occasionally as it simmers to prevent the pasta from sticking to the bottom. 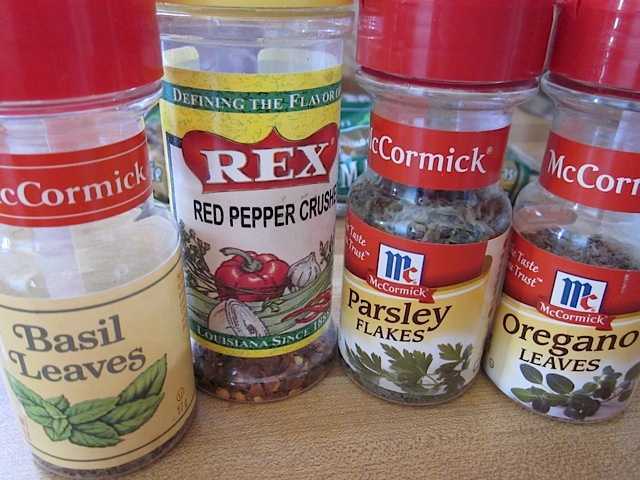 Give the dish a quick taste and adjust the seasoning to your liking. 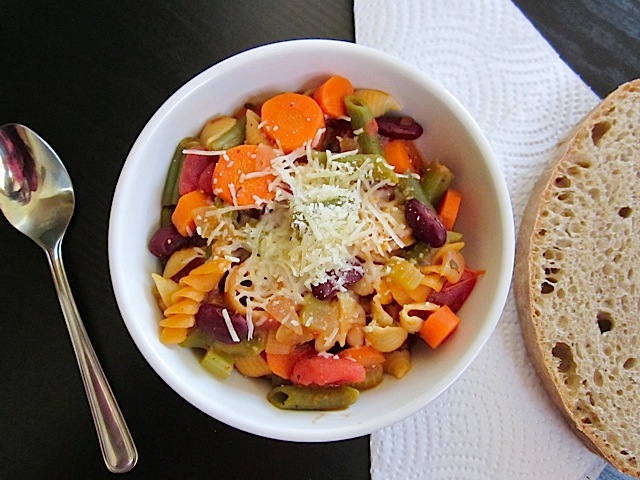 Ladle the Pasta e Fagioli into a bowl and top with shredded Italian cheese (parmesan, romano or asiago). 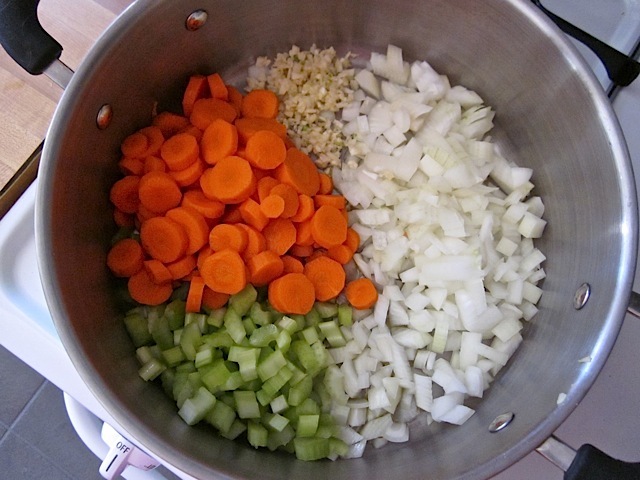 Start by chopping and cooking the onion, celery, carrots and garlic in a large pot with olive oil. Cook them just until they have softened (3-5 minutes). Drain the beans (but not the tomatoes) and add them all to the pot. 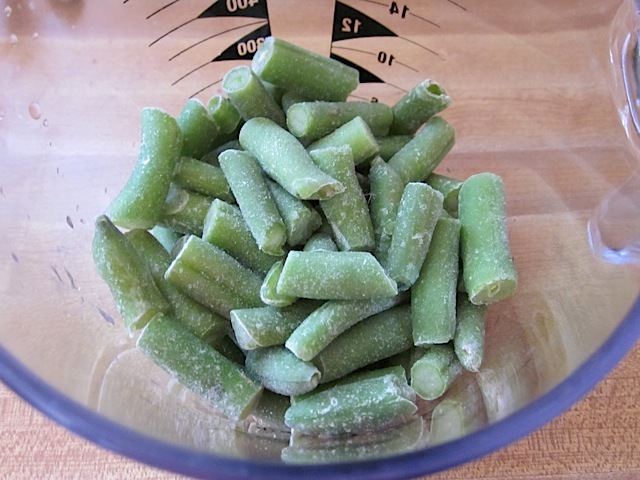 Also add the frozen green beans. Give everything a good stir (it’s already gorgeous!). 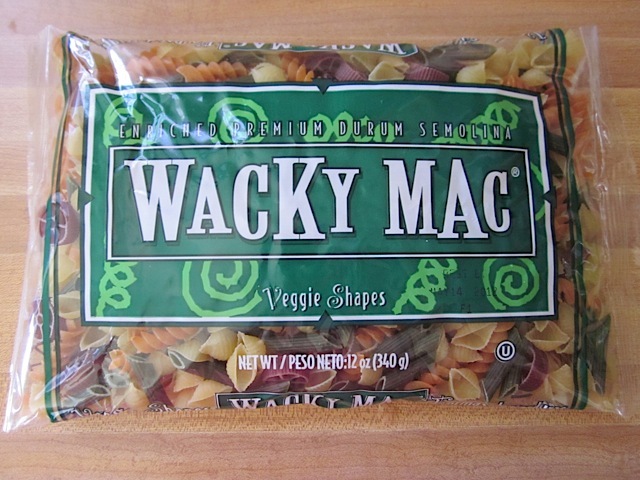 Ditalini is usually used in Pasta e Fagioli but it was really expensive at my local grocer so I substituted this wacky mac. I thought the colors and shapes would look nice in the dish. Feel free to use any shape. 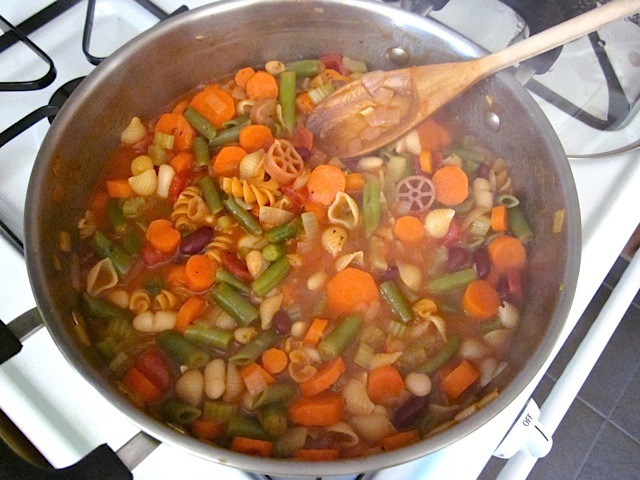 Add the pasta along with 3 cups of water and 2 tsp (or two cubes) of chicken or vegetable bouillon. Place a lid on top and let it simmer for about 10 minutes or until the pasta is fully cooked. Stir it occasionally to keep the pasta from sticking to the bottom. Give it a taste and adjust the salt and pepper to your liking. Top each serving with cheese. 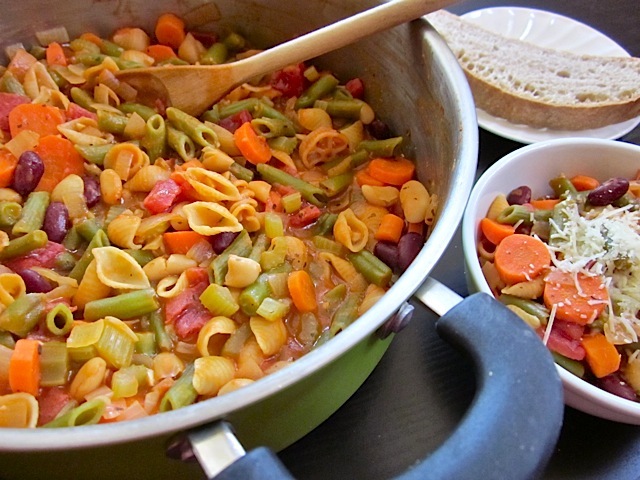 Special thanks to René over in Germany for suggesting this super hearty, pasta and bean stew!! – Saute bacon or pancetta in the pot prior to cooking the onions, carrots, celery and garlic. 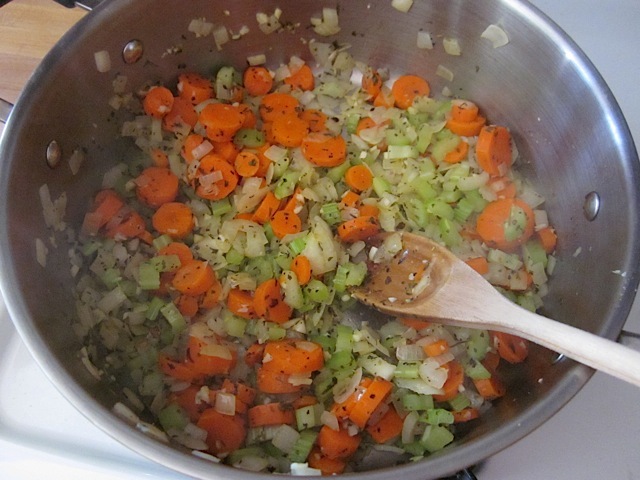 – Add a cup of white wine after sauteing the onions, carrots, celery and garlic. 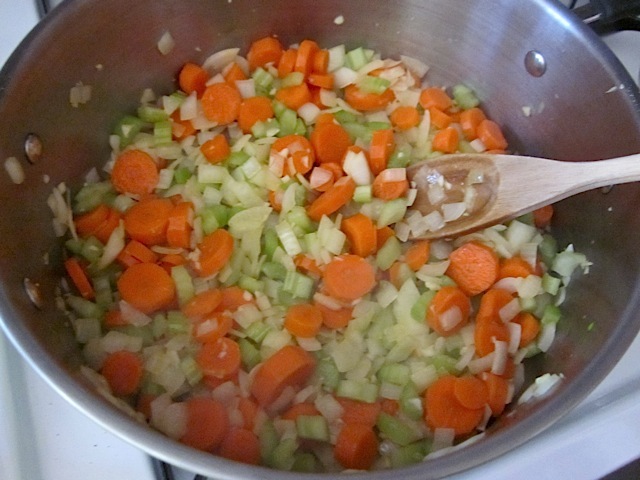 – Add two more cups of broth to make this into a soup rather than a thick stew. Delicious! I expected to like it, since I chose to make it, but I was surprised at just how much I liked it. Next time I’m going to add some kale as well, per Beth’s suggestion. If I add some Italian sausage as another reviewer did, I might even be able to get my vegetable-hating husband to eat it. This is EXCELLENT! Based on your other recipes, I tried Better Than Bouillon Vegetable for the first time, rather than the chicken stock. I could not be happier — what a rich, deep flavor in a jar. I also traded red beans for garbonzos, because it’s what I had in my house. This has that “I cooked all day” taste, for roughly 30 minutes worth of effort. Thank you for offering vegetarian/vegan options that are ridiculously yummy. Looking forward to leftovers! The pasta may get very soft, but otherwise it would probably freeze fairly well. Yet another delicious recipe!! 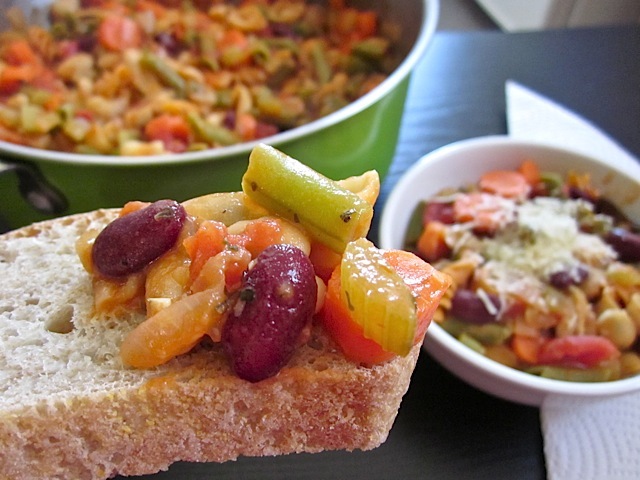 I made it as a vegetarian stew, and was huge hit with my 3 teenage boys! Being able to serve a healthy meal to a family of 5 for under $10 is a blessing (and there are lots of leftovers for lunch!). Thank you Beth! I don’t know what I made wrong, but something was missing. It doesn’t tasted marvellous. Thank you so much for this recipe. I will be making it a LOT this winter. It is now my favorite soup. This recipe was very forgiving. :) I have a son who can’t eat tomatoes, so I made some substitutions (an extra cup of broth for the tomato sauce and a cup of chopped zucchini for the diced tomatoes) and it turned out great! We also used rice/quinoa pasta and didn’t really need to adjust the cooking time at all. It took me longer than 10 minutes of prep time (maybe I’m a slow chopper?) but the canned beans are a big time saver. I’m always looking for one pot meals with lots of veggies, and this one was perfect. Thank you! Thank you for sharing that you left out tomatoes and what you added instead. My very picky daughter won’t touch tomatoes, but everything else in here is okay. I feel the tomatoes really add flavor and am always reluctant to try a recipe without.